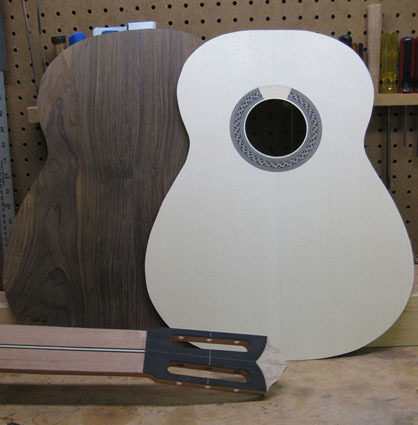 All my guitars are entirely hand-built, according to the client's specific needs. I only use top quality materials, hand picked to optimize the sound of the instrument and its esthetic properties. Every aspect of my work is original, from the shapes of the body, neck and head, as well as the hand made rosette, the bracing and combination of woods. At the client's request, I can make different scale-lengths, smaller bodies and various neck widths or thicknesses in order to meet one's specific needs. Since the fall of 2010, I have been making double top guitars. 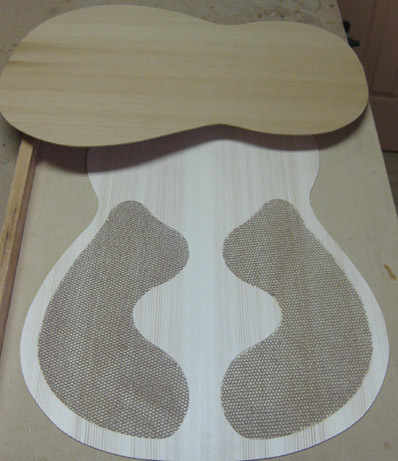 The soundboard of a double top guitar is made of 2 very thin (0.5 to 0.8 mm each) layers of tonewood (Cedar or Spruce), separated by a layer of Nomex, a synthetic material used in the aeronautic industry. This combination greatly enhances sound of the instrument, with a wider range of tone and increased volume and projection. 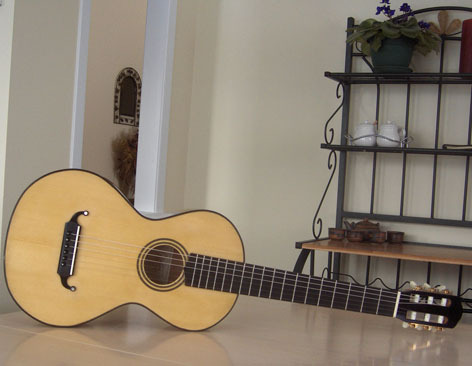 I also use many modern features of the classical guitar, such as the elevated fingerboard (for an easier reach up the upper notes), the armrest, double sides and a soundhole, as chosen by the client. I am also offering a Romantic Guitar model. Based on a 1839 guitar by French luthier René Lacote, it has a smaller body and a shorter scale length typical of that era. It is perfect for those who want to reproduce the sound of the Romantic period, known for composers such as Sor, Giuliani and Aguado.